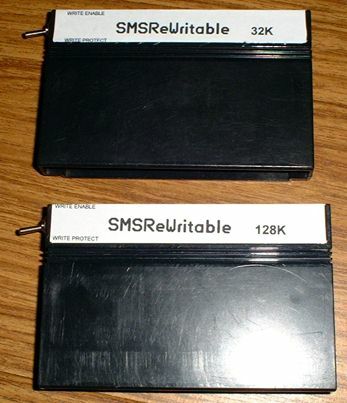 SMSReader - Building a Rewritable Cartridge - Development - SMS Power! This section covers the modifications needed to convert your unwanted Sega Master System games into battery-backed, SRAM-based rewritable cartridges. In conjunction with the SMSWRITE utility, this will allow you to play downloaded ROM files or homebrew programs on the real Master System console. If you're going to modify SMS cartridges, you first have to be able to open them! This isn't so difficult in the case of games manufactured prior to 1990, which all use standard Philips cross-head screws. 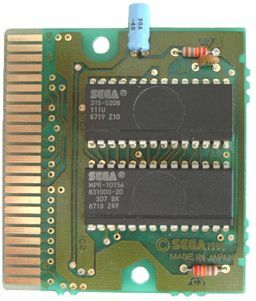 Later games, however, feature "External Line Head"/"System Zero" security screws, the same as found on Mega Drive cartridges, which need a special tool (sometimes called "Game Bit") to remove them. These tools can be obtained from specialist outlets, but you may wish to try making your own. 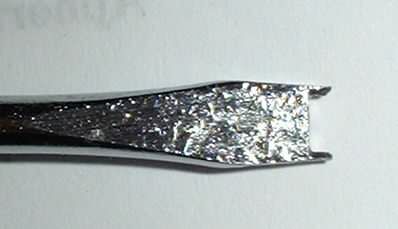 The basic technique involves taking a flat-blade screwdriver and filing a slot to create a "fork", which then fits opposite sides of the External Line Head screw. File slowly and carefully, stopping after every few strokes to check the tool against the screw. For blades which are too wide to fit the notches on the screw, you'll need to file across the blade too, to narrow it down. If you want to create a 32KByte rewritable cartridge, pretty much any single-chip cartridge is suitable for modification - it doesn't have to be a 32K game, it can be a 128K, 256K or 512K game with the mapper integral to the ROM. It helps if the board has a 32-pin ROM (as shown below) since that's the board type shown in the 32K cartridge tutorial, but a board with 28-pin ROM is also suitable. 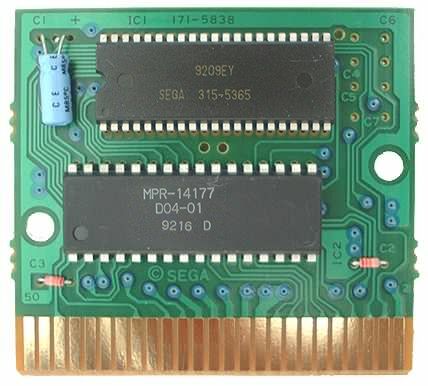 If you'd like to create a cartridge with 128KBytes (1MBit) or more of SRAM, then you need to find a game which has a separate mapper chip marked 315-5208, 315-5235 or 315-5365 in addition to a standard 28- or 32-pin ROM. To find out more about these chips, and which games they appear in, take a look at the excellent SMS Paging Chips document put together by Eric Quinn on this subject. Here's a brief précis for now, though, which may be of help if you intend to browse used games shops for suitable cartridges. The above game, World Grand Prix, is an example of a One Mega cartridge using a 315-5208 mapper. I have created a 128K rewritable cartridge from a cart with a board like this, but have yet to write a tutorial for it. 315-5365 is a dual slot mapper (actually two and fifteen sixteenths of a slot, but I'll let that pass) which handles ROMs up to 512KB. (It may handle saved game memory as well, but I'm not too sure about that.) It can be regarded as a modified version of the 315-5235, mentioned below. From what I can see, it appears that all Two Mega games made by Taito use the 315-5365. Examples include Operation Wolf, Bubble Bobble and Chase HQ. If you find a copy of any of these games which ''does not'' contain a 315-5365, please let me know! This picture shows the Two Mega game Bubble Bobble, complete with 315-5365 mapper. Board colour is invariably orange-brown. I have not yet written a tutorial for modifying a cartridge with 315-5365 mapper. 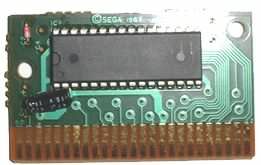 315-5235 is by far the most common Sega Master System mapper chip, found in a lot of Two Mega and Four Mega games, and some of those with battery-backed memory for saved games. (It's also reportedly found on some Sega arcade boards.) 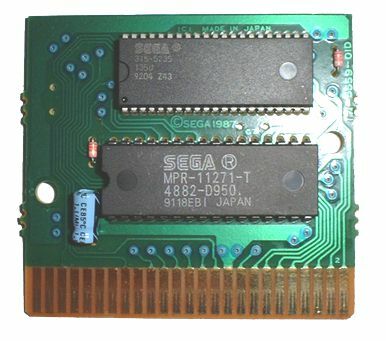 This dual slot mapper chip can handle up to 512KB of ROM and up to 32KB of RAM for saved games. There are many games which may or may not have a 315-5235, but games which always seem to contain this chip include After Burner and Space Gun. (Once again, if you find a copy of any of these games which does not have this chip, I'd very much like to know about it!) Board colour can be orange-brown or greyish-white. This picture shows an After Burner cartridge board, complete with 315-5235 mapper chip. This is the type of board shown in the 256K cartridge tutorial, so you're strongly advised to pick up a used After Burner if you want to create a 256K rewritable cartridge. The following sections explain how to create 32K and 256K writable cartridges with Static RAM (SRAM) and battery backup. The Static RAM must be of the low power variety, which retains data at low voltages and with low current drain. For the 32K cartridge, a 32K 62256 chip is suitable, whereas the 256K cartridge can be done using a pair of 128K 431000 chips (or some equivalent, such as 628128). The battery backup circuit is based around a Harris/Intersil ICL7673 watchdog chip, and is powered from a CR2032 3 volt lithium battery. The chip enable and output enable lines are, where necessary, implemented using 4000 and 74HC series logic chips. A two-way toggle switch is used for write protection - it forces the write enable line high when the cartridge is not to be written. Static precautions should be taken when handling any of the ICs described in these procedures.